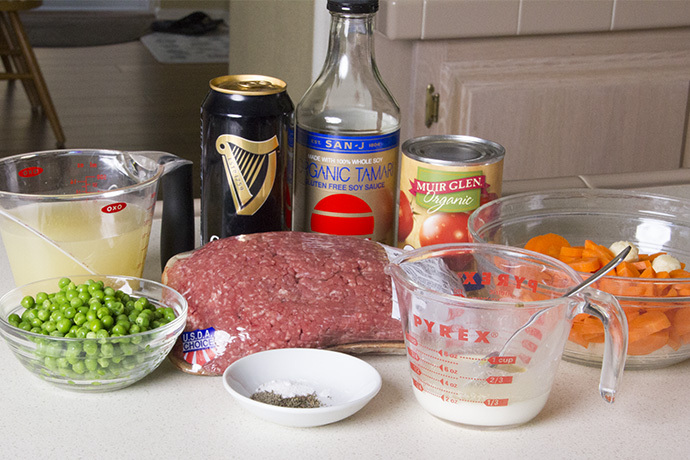 I first tasted Guinness Shepherd’s Pie at Dargan’s Irish Pub in Santa Barbara, California. It’s a simple dish, but rich in flavor, and ohhhh how I love it so! I figured I could come up with something that was close enough to my favorite dish at Dargan’s, and I’m pleased with the results. 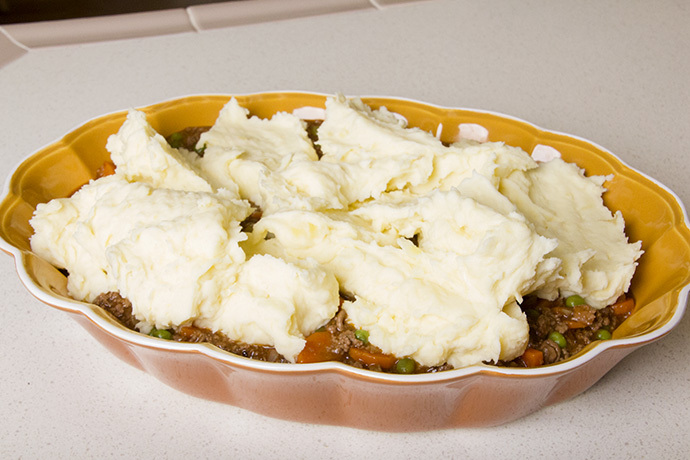 This Guinness Shepherd’s Pie is a simple blend of ground beef, onions, carrots and peas, in a broth of Guinness Stout, with chicken broth and a bit of tomato and some seasonings, topped with creamy mashed potatoes. I used just a bit of cornstarch to thicken the broth. Look at that delicious filling hiding under a layer of creamy potatoes. Cook the ground beef just until it loses its pink color and releases all the juices and fat. Thoroughly drain the cooked beef. 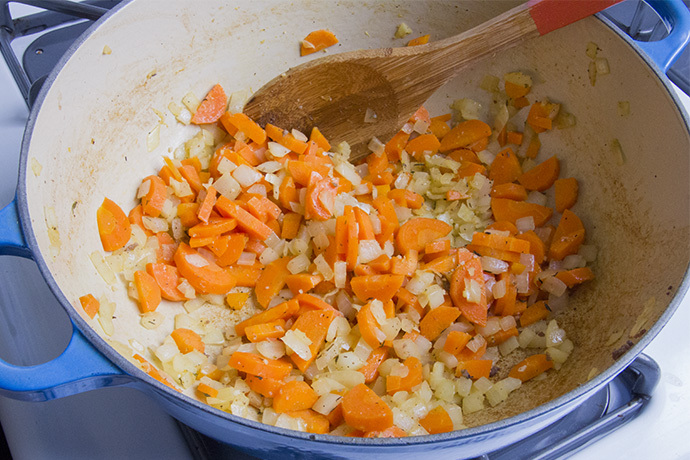 In same pot, cook the carrots and onions until the onions are translucent. 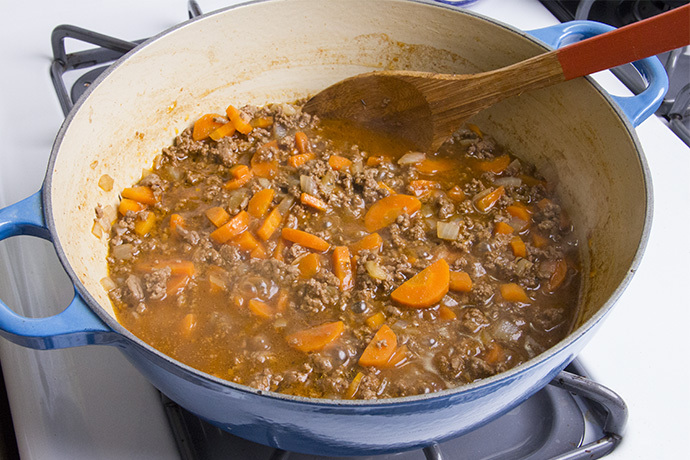 Return the cooked beef to the pot with the carrots, and add the Guinness and tomato sauce. 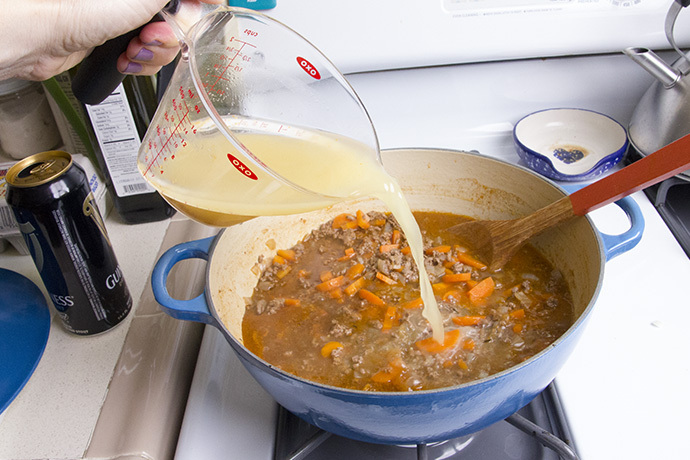 Cook until the liquid is reduced by half, about 15 minutes. Add the chicken broth and simmer until liquid is reduced by half, about 20-25 minutes. Stir in the cornstarch mixture and cook, while stirring, until the broth has thickened slightly. 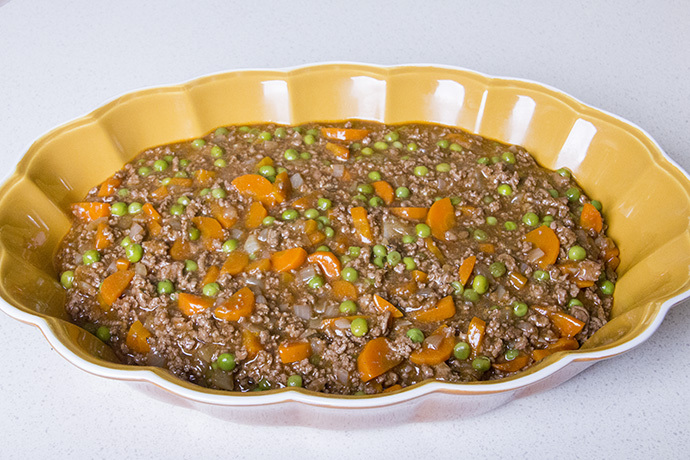 Pour the beef mixture into the prepared casserole dish. Boil the potatoes in a large pot of salted water until they are tender. Drain and return to pot. 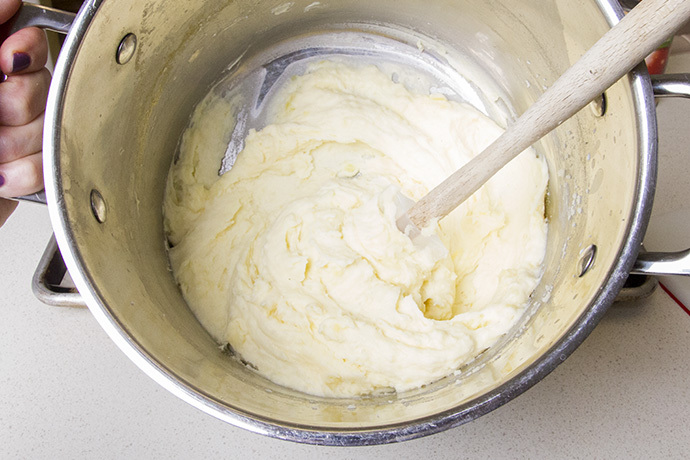 Add the butter and milk and whip until fluffy. Season to taste with salt and pepper. I don’t mind a few lumps but you may want to beat them until they’re completely smooth. I whip my potatoes in the same pot I cooked them in. Why create more dirty dishes? 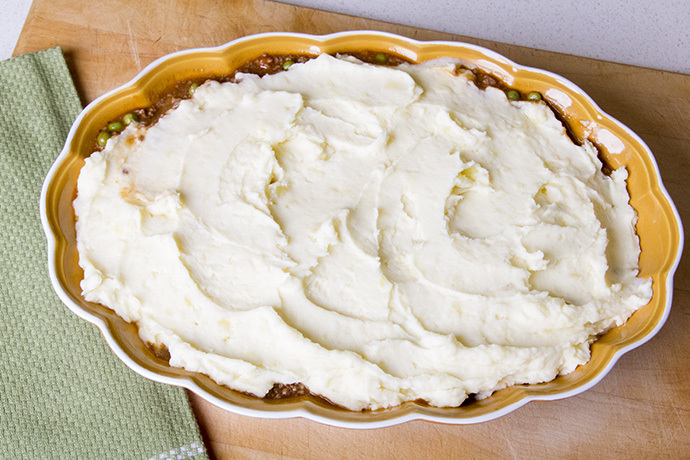 Carefully spoon the whipped potatoes over the filling. You don’t want to be too heavy-handed or the potatoes will sink into the filling. Lightly spread the whipped potatoes over the top of the filling. 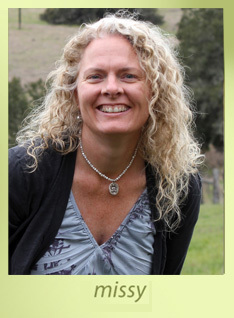 Get as close to the edges as you can but it doesn’t have to be perfect. YUM! Heat 1 tablespoon olive oil in a 3-4 quart heavy pot or Dutch oven. 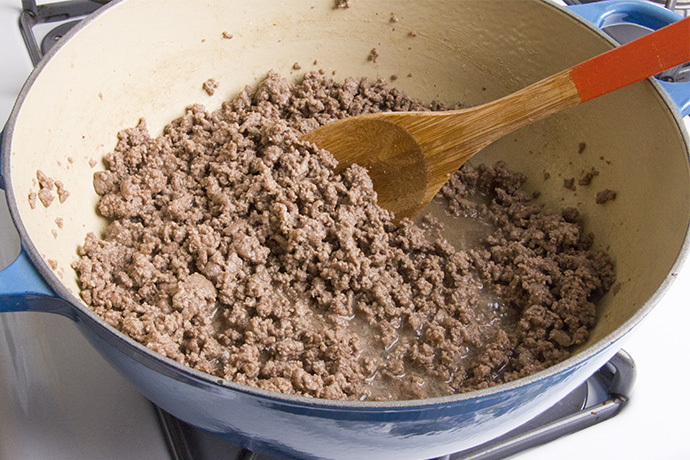 Add ground beef and cook over medium high heat, stirring and breaking beef up any chunks of beef, until brown. Drain beef and set aside. In same pan, heat remaining 1 tablespoon olive oil over medium heat. Add onion, carrots, garlic, thyme, salt and pepper. Cook, stirring occasionally, until onions are translucent and have softened. 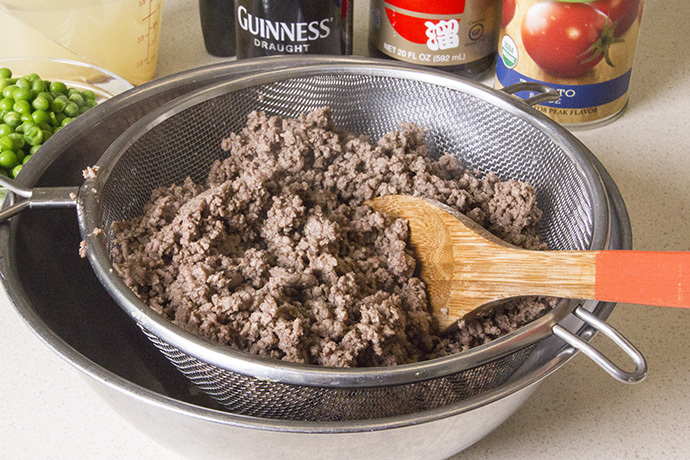 Return ground beef to pan, add Guinness and tomato sauce, bring to a simmer and cook, stirring occasionally, until liquid is reduced by half, about 15 minutes. Add chicken stock and return to a simmer, stirring occasionally, until reduced by half, about 20-25 minutes. 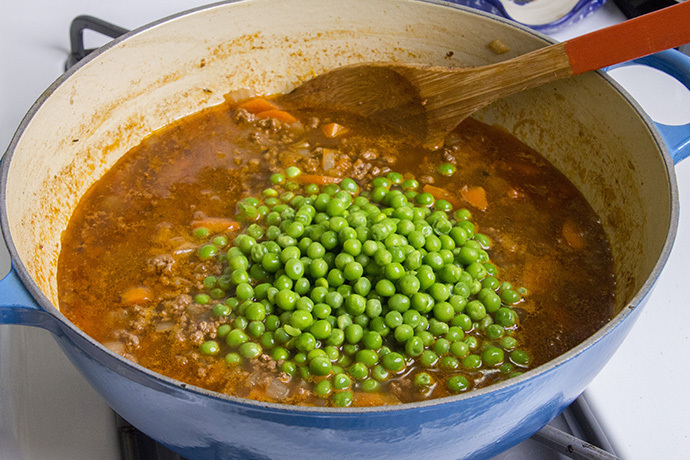 Stir in the Worcestershire sauce, soy sauce and peas and simmer 2 minutes. In a small bowl, mix cornstarch and water. 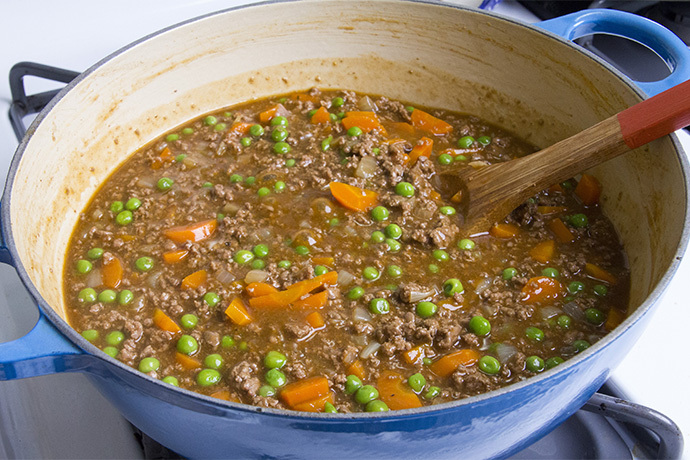 Stir cornstarch mixture into the beef mixture and cook 1-2 minutes, until slightly thickened. Spoon mixture into a 2 quart casserole dish, or 6 individual oven-proof serving bowls, sprayed with nonstick cooking spray. I like these Pyrex 2-cup dishes because they go from freezer to oven or microwave, are sturdy, not made from plastic and are the perfect size for a single serving, they can be reused over and over, and travel well. Boil potatoes and garlic in a large pot of salted water for 10-12 minutes, until they can be easily pierced with a fork. Drain potatoes and return to the pot. Heat over low heat for 15-30 seconds to dry out the potatoes. 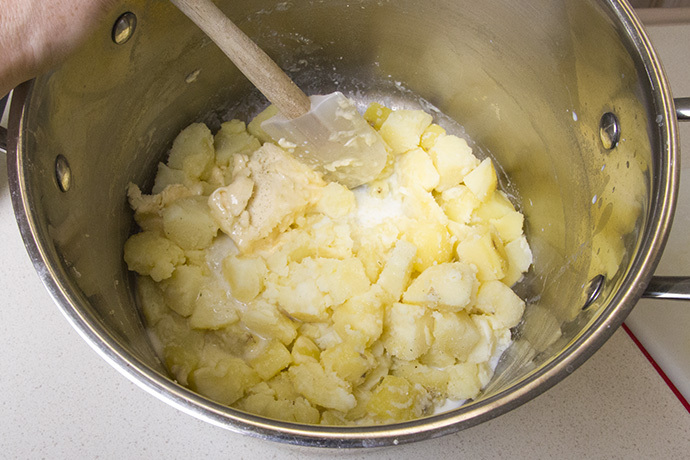 Mash the potatoes, whip with a handheld mixer, or pass through a ricer, mix in butter and cream, and season with salt and pepper. 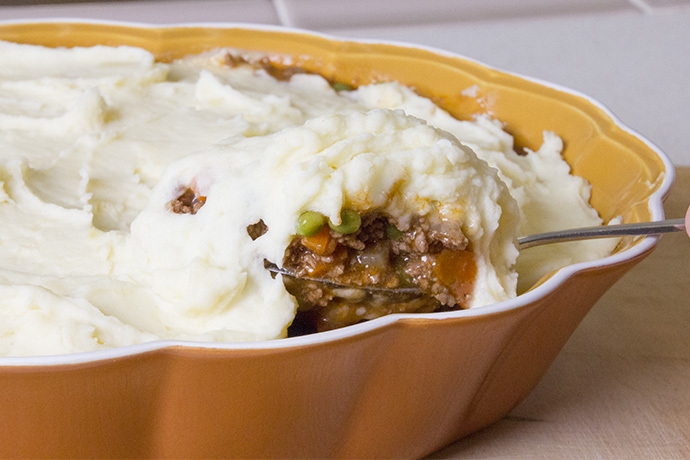 Gently spoon potatoes over top of ground beef filling, then carefully spread the potatoes to evenly cover the top. Bake at 350° for 25-30 minutes, until filling is bubbling. Serves 6. The pie can be made ahead and refrigerated for two days before serving. Bake at 350° for 30-45 minutes, until filling is bubbling. It can also be frozen for up to three months. Thaw completely in the refrigerator before reheating as directed above.